Cameroonian composer and producer Franck Biyong who appeared at PASS 2009 is back with a new Afrolectric release. 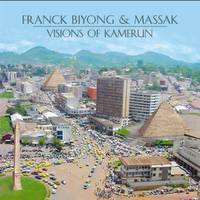 Recorded in Cameroon, Visions of Kamerun see Biyong and his Massak crew navigate the psycho-geography, history and dreams of his home country, as well as the roots, passages and slipstreams that link it to Europe. Featuring 18 tracks including nine sustained spoken interludes, the album offers a nod to the wisdom, vision and style of Bob Marley’s Talking Blues (released in 1991 on Tuff Gong). Mixed by Grant Phabao in Paris, the album brings together delicate traditional percussion, subtle afro-jazz drummings, beautiful minimal guitar riffs, and Massak’s typically powerful horn section, with soulful vocals from Franck Biyong, Sandra NKaké and Gladys Gambie. Defining a salutary musical movement called Nuevo Afropean Jazz, with a solid, deeply sincere emotional core, the album balances jazz exploration, rhythmic vivacity, soul depth and cultural immersion. Category: Pass Blog | Tags: Franck Biyong | Bookmark: permalink. ← Memory of how it feels. . .